19-year-old Pavan’s life has changed for the worse because he is suffering from a rare but deadly form of blood cancer. 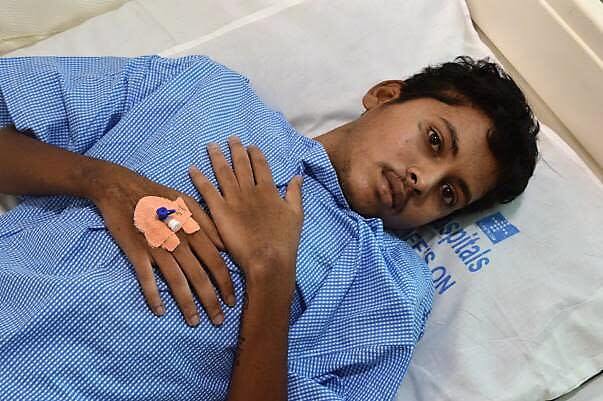 In just 2 months, Pavan’s condition has deteriorated so much that now, his only chance of making it through this is to undergo an urgent bone marrow transplant. But, Rani, a single mother who is riddled with debt, feels tormented because she has nothing to save her son’s life. The 19-year-old is diagnosed with a Philadelphia chromosome acute lymphoblastic leukemia which is a very rare form of blood cancer. 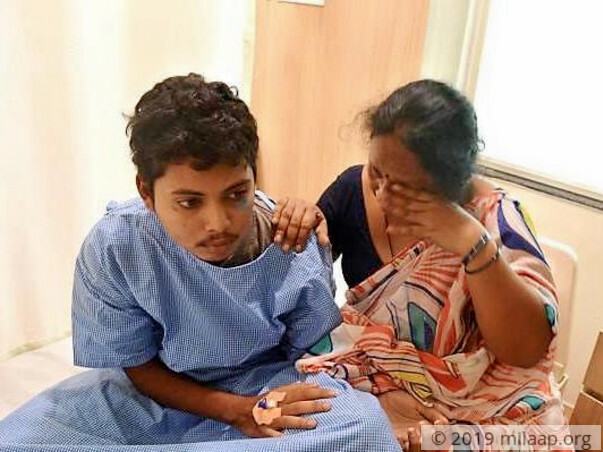 This has spread so rapidly in Pavan’s body and if he doesn’t undergo an urgent bone marrow transplant, he could lose his life in a few months even with chemotherapy. Rani’s husband passed away when Pavan was just a year old. Regardless of poverty, by herself, Rani has not only raised Pavan and her elder daughter Haritha but has also managed to give them a good education. Rani is uneducated but she has been working as a tailor all these years and earns around Rs. 250/day. Until now, Rani has borrowed Rs. 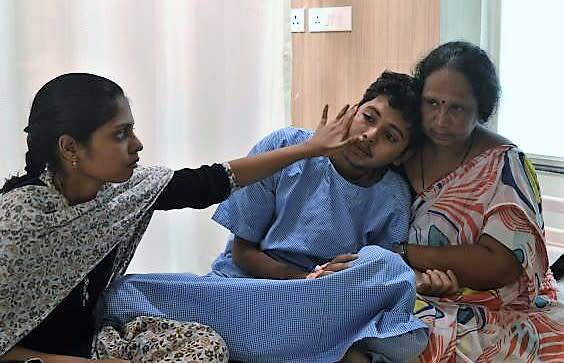 5 lakhs from her friends and relatives to help her son undergo chemotherapy and other treatments. No one is willing to loan her more money because she hasn’t repaid her previous loans. She has absolutely nothing left and Pavan’s worsening condition cannot be cured without a life-saving bone marrow transplant. For this, Rani is in desperate need of Rs. 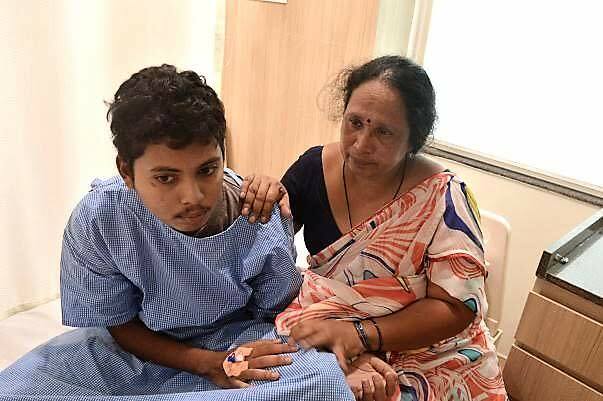 25 lakhs and she, simply, cannot save her son without your help. 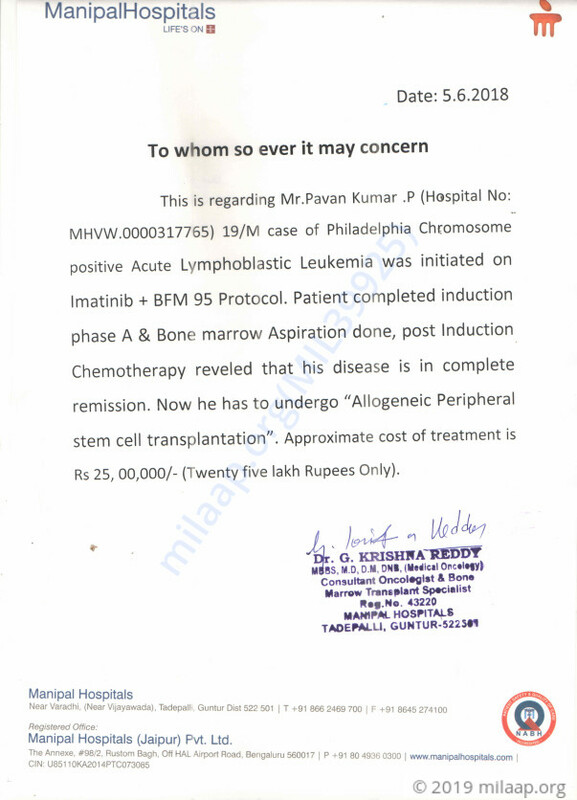 We are delighted by the immense love and support shown towards Pavan. He is currently at home recovering from the surgery. He had a fever for a couple of days which has subsided now. He is required to go in for two check-ups every week to ensure there are no issues. We have been asked to be very cautious for the first hundred days post surgery. We are hopeful that he would be able to make a complete recovery. Please keep Pavan in your prayers! Here's a quick update on Pavan. Pavan is recovering post transplant and currently got admitted in the hospital due to urine infection. We shall keep you posted. I am rejoiced by the love and support given to my son Pavan. I would like to inform you that he had undergone his bone marrow transplant successfully and was discharged a few days back. However, he started to loose weight and was also vomiting frequently, due to which he has recently been admitted again. Please pray for his good health. Thank you all for the love and support blessed on him. Will keep you posted.